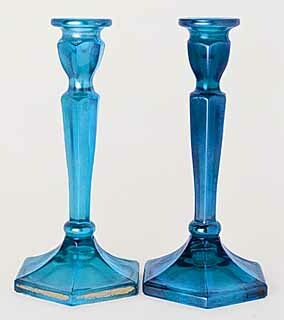 Until recently, these were listed these as Fenton's Florentine pattern. They are very similar. The main difference is the little bulbous band between the stem and base on this one. On the Fenton version it's much less pronounced. The #695 sticks are 8 3/4 inches tall; the #696 are 10 1/4. As auctioneers invariably list these as Fenton's Florentine, see that listing for prices. 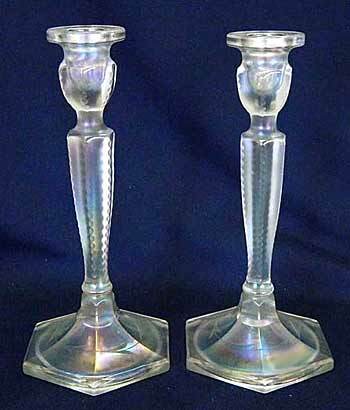 The set of white #695 candleholders on the right are unusual in that they have small notches cut into the vertical edges. They sold in 2012 for $725.